The plot: Post-World War II Italy is going through devastating period of depression. A job is hard to come by. Antonio Ricci manages to get a job after two years of unemployment: to drive around Rome and put up posters of Rita Heyworth, and it requires a bicycle. His bicycle is broken and he goes to great length to put together a sum of money enough to repair it. But his precious bicycle is stolen the first day of work. Together with his son they go around the city trying to recover the bicycle, but all they find is desperation. 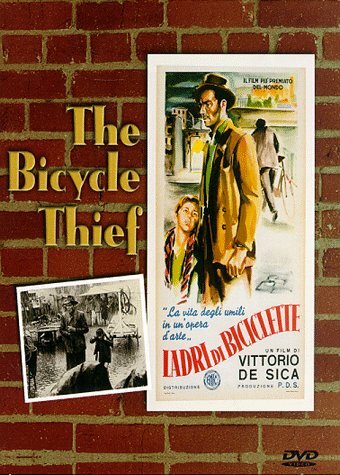 The summary: Ladri di biciclette (Bicycle Thieves – plural in the original title) is one of the most acclaimed Italian movies. It was written and directed by Vittorio De Sica based on the novel by Luigi Bartolini. It’s a powerful drama set in the post-war Italy about a simple man trying to keep his family fed during times of hardship and this man is being crushed by the invisible forces of economic depression and bad luck. In the original release in United States in 1949 Hollywood did not give the movie the Seal of Approval because of two censored scenes De Sica refused to cut – one where the Antonio’s son relieved himself against the wall and another where Antonio leaned against the wall of the brothel. Year later Hollywood apologized and gave the film a well deserved “special” Oscar and a Golden Globe. Check out lyrics of the songs from the movie: a classic Napolitanian song Tamurriata Nera and Ciccio Formaggio (if the links are dead, Google them). The good: Great direction, light, music and acting. This movie is a poetic work of art in every respect. Very organic and moving film. Very captivating and interesting too. The boy, Enzo Staiola, who played Bruno, was picked from the street at the age of 9 to star in The Bicycle Thief and he is a joy to watch. He’s tiny, with bare ankles and in a coat covered with holes. The scene when Bruno and Antonio are under the rain is wonderful, and there are other powerful scenes like that, like the scene in the tratoria where a man plays mandolin and Bruno looks at some well-off customers eating full pasta plates while he and his father are eating just mozzarella and bread, but pretend to be eating a royal treat. And the scene where Antonio is forced to steal and Bruno saw it is what makes me watch this movie over and over. The father is crushed, but Bruno forgives him when he slips his hand into his father’s in the final scene when they disappear in the crowd. Through this pair or people De Sica paints a picture of life of all people in Italy. The bad: They don’t make movies like this anymore. Similar movies: Vittorio De Sica’s Shoeshine (1942), The Children Are Watching Us (1947). Federico Dellini’s La Strada (1954). DVD features include Biography and Filmography of Vittorio De Sica and Theatrical Trailer.